Mirobot is a robotics kit that’s designed to get kids more interested in technology, engineering and programming. 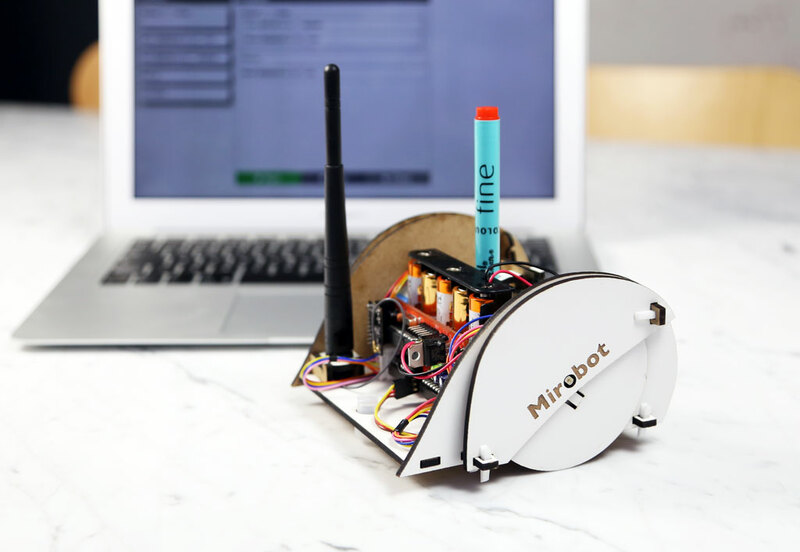 Children solder and build it themselves, and then can use a drag-and-drop programming tool in their browser to get the robot to draw shapes and patterns. All of the designs and software are open source, which means that once it has been used for its original purpose, it can be adapted to do new and unforeseen things. Although primarily a drawing robot, it can also use additional sensors in order to be able to experiment with making it autonomous. Arduino compatibility means that extending and modifying it is well documented and straightforward. Using WiFi with JSON over WebSockets to communicate which means that it can be easily controlled from a web browser as well as easily integrated into any other programming language or tool. Mirobot was inspired by a visit to the London Science Museum when I came across one of the original Turtle robots used in schools in the UK in the late 70s and 80s. I used to use these robots as a child and thought it would be interesting to make a modern version that was based around open hardware platforms like the Arduino. The idea that what was once a very expensive piece of equipment could now be made inexpensively really appealed to me. Moving from one-per-school to one-per-child is a great advance and enables much greater learning. It’s currently on Kickstarter and has made great progress – it’s 320% funded now with a little over a week left to go.